Hi, Kevin from Orlando Fun and Food. One of the nice things about living in Orlando, and having an annual pass to the Disney theme parks is being able to go at just about any time. It really comes in handy when friends and family come into town. Recently a friend who lives nearby wanted to meet at EPCOT and I said why not. It was nice to have the time to visit with her while enjoying the park. She wanted to have dinner in the park and I let her decide where and when. 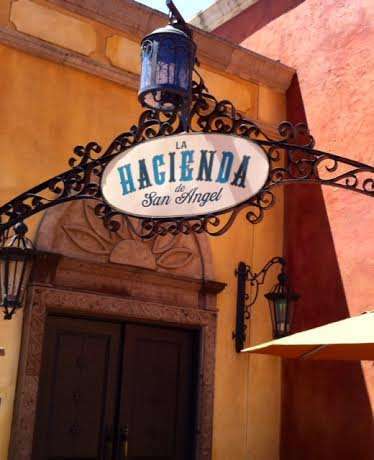 She picked a restaurant in Mexico, the La Hacienda de San Angel. This is a restaurant sitting on the waters edge of World Showcase Lagoon. I had not been there before, so I was excited to try it out. All the food on the menu looked good, but both of our eyes hit on one particular dish. Puerco en Salsa de Ciruela. It was a grilled pork rib eye, served with carrot puree, caramelized onions and plum sauce. I have to say this was one of the best meals I have had in a while. It was cooked to perfection. Of course we did get a basket of chips and salsa with two dipping salsas. I would go back there again for this dish alone, but will think about trying something different. The best part of the evening in this restaurant was that we were seated right next to large viewing windows looking out onto World Showcase Lagoon, and had a birds eye view of IllumiNations: Reflections of Earth. That is EPCOT’s end of the night show. The food and the view of the show were both great. It is always best to make reservations for the restaurants at EPCOT, and they do fill up fast. I do recommend this restaurant, and hope you will have a chance to enjoy it also.